The Joie Sansa 2-in-1 Swing - Petite City sways back and forth or side to side to soothe little ones to sleep. 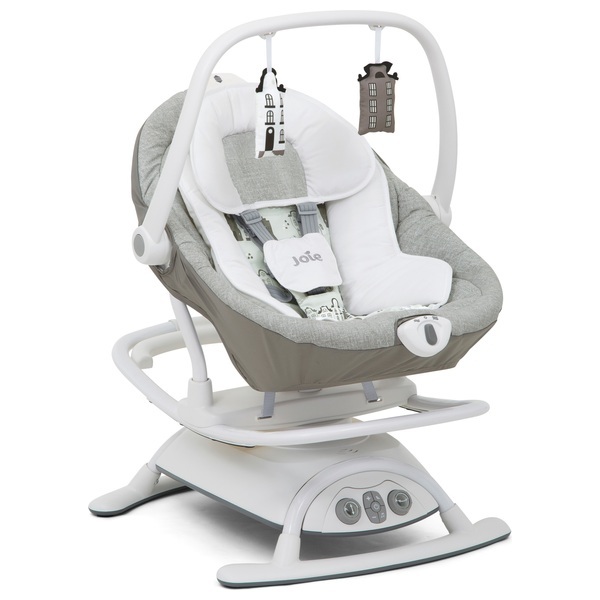 This multi-motion swing can sway, glide and swivel every which way to help little ones drift off to sleep. A simple twist turns the seat 90˚ on its frame for a whole new way to sway. When you need a hands-free moment, the Joie Sansa 2-in-1 Swing keeps your child cocooned in a cosy seat with 3 reclining positions and a 5-point safety harness. 5 nature sounds and 5 lullabies create a calming atmosphere as baby sways. Optional gentle vibrations offer even more ways to soothe your little one. When it’s time to play, 2 plush toys hang from the carry handle, encouraging little ones to reach, bat and grasp. For power-free soothing, lift the seat from the frame to create a gentle rocker. In rocking mode, the Joie Sansa is ever so portable, with a small footprint and a pivoting carry handle to easily lift the seat from room to room. There’s even a stop foot that flips down to stopthe rocking motion. The machine washable infant insert and head support offer wraparound comfort to keep smaller babies cosy. EU Warning: Suitable from birth to maximum user weight 9kg. Never leave your child unattended.